"Ten percent of all pregnancies in the United States are affected by pre-eclampsia, and one in five maternal deaths, and one in three obstetrical readmissions are all related to pre-eclampsia. Pre-eclampsia is one of the leading causes of maternal mortality and morbidity. Heart Safe Motherhood was developed to reduce these statistics." Penn Medicine uses innovation to reduce disease in volatile postpartum period. The 2018 AHA Innovation Challenge was launched by the American Hospital Association (AHA) to source and spread new ideas and novel approaches for integrated care delivery and financing models designed for specific high-need, high-cost populations. In its inaugural year, the Innovation Challenge was a big hit with over 90 submissions. Penn Medicine was the second place winner and received a $25,000 prize for their submission of Heart Safe Motherhood. First American met with Katy Mahraj, MSI, Director of Innovation for Women's Health, to learn the story of Penn Medicine's winning innovative idea. When the Innovation Challenge was announced, it made a big splash in Penn Medicine's Center for Health Care Innovation. Dr. Sindhu Srinivas and Dr. Adi Hirshberg, and Katy had already been working on Heart Safe Motherhood and thought this was a great opportunity to bring attention to the project. Additionally, the Innovation Challenge could create awareness so providers around the country could adopt their idea. The prize money that the Innovation Challenge offered the winners was the perfect funding opportunity for Penn Medicine to invest in the program implementation. 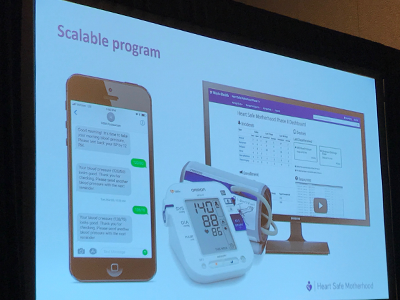 Penn Medicine's innovation of Heart Safe Motherhood is a text-messaging monitoring program. The focus is on women who are at risk of hypertensive issues in the immediate postpartum period. In 2013, the American College of Obstetricians and Gynecologists issued a national guideline recommending that providers measure the blood pressure of at-risk women at two time points - 72 hours and seven to ten days after delivery, to allow early diagnosis and treatment of issues related to pre-eclampsia. Clinicians such as Dr. Srinivas and Dr. Hirshberg noticed that patients were not coming back for an office visit because it is difficult to do so with a newborn and recovery from delivery. With this in mind, they developed the idea of providing patients' blood pressure monitoring from the convenience of their home. Several initial questions came to mind when developing the idea of Heart Safe Motherhood. How would it work? How would the right patients be identified? How is the capture of blood pressure data automated and what do you do with that data? All of these pieces were thoughtfully put together to create Heart Safe Motherhood. The program identifies rising blood pressure, initiates medication, and keeps patients at home. Risk of disease, such as stroke or seizure, can be identified at the early signs so the women return to the hospital for appropriate care. The goal of Heart Safe Motherhood is to be able to catch complications related to pre-eclampsia early enough that it can be managed appropriately. Winning the Innovation Challenge's second place prize of $25,000 impacted Dr. Srinivas, Dr. Hirshberg, their team, and the rest of Penn Medicine. There were several colleagues involved in the Heart Safe Motherhood project including physicians, nurses, and administrators. The Heart Safe Motherhood team at Penn Medicine was honored to have their program acknowledged by the American Hospital Association. In conclusion, Katy advised, "Innovation when you come down to it, it's about getting smart about change, how you perform, how you provide better services, and measuring what you do. It's really about trying to make changes for the better." Penn Medicine is a large academic health system that focuses on world renowned research, education, and patient care. The OBGYN department and women's health service line have been at the forefront of leadership when it comes to these main focuses. The Innovation Center is six years old and was founded to bring methods of design thinking and innovation to the health system to accelerate their readiness for the future of care. The Center for Health Care Innovation's team partners with physicians and clinicians to create and implement new care deliver models. Katy has been with the Center for Health Care Innovation for the past five years and serves as the Director of Innovation for Women's Health. Dr. Srinivas serves as Director of Obstetrical Services at the Hospital of the University of Pennsylvania and co-founder and medical director of Penn Medicine's winning innovation, Heart Safe Motherhood, alongside Dr. Adi Hirshberg, Maternal Fetal Medicine Physician and co-founder and Director of Clinical Operations for Heart Safe Motherhood. First American Healthcare Finance was the marquee sponsor of the Innovation Challenge. First American works with hospitals and health care providers across the nation to help them finance or lease medical equipment, technology, software, renovations and/or expansions. First American helps providers invest in innovative projects, expand services and match the financing of assets to their useful life. To inquire about financing or leasing your projects with First American, contact them here. "Strategic partnerships are really important for innovation to happen in healthcare. Finding organizations that are like-minded that share your same vision, your same way of working, and a commitment to quality and to excellence is really important."